I wanted to try out the Bluetooth library for J2ME (JSR-82) and made a small application to log the Bluetooth devices that surround me day-to-day. An all these bluetooth devices were found in only 10 minutes, while being on a train! To download it, go to the download-section of Sourceforge. For more information go to the Wiki at Sourceforge. Motion-Sensor: With access to the motion sensor, it would be possible to search more often for other devices, when someone is walking. At the moment the application looks every 2 minutes for Bluetooth devices nearby. For example the IPhone or the Sony Ericsson W910i has such a functionality. 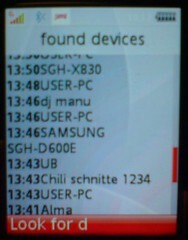 BlueJackX - Same functionality as Bluetooth Logger, but this only works on Symbian-Smartphones. For desktop computers there are tons of applications, so I won't list them here. Check out NetStumbler for Windows, which is very popular for Wardriving.